Students are rocking and rolling with their “Education Remixes”! After analyzing their data from fall NWEA testing, we saw that typically informational text was their lowest score. Therefore, students have been taking on the challenge of creating Informational Text Remixes. They have reviewed the Common Core State Standards for informational text and have selected a standard to design their Remix around. As I have scaffolded their Remix experience, they have now become familiar with the process. 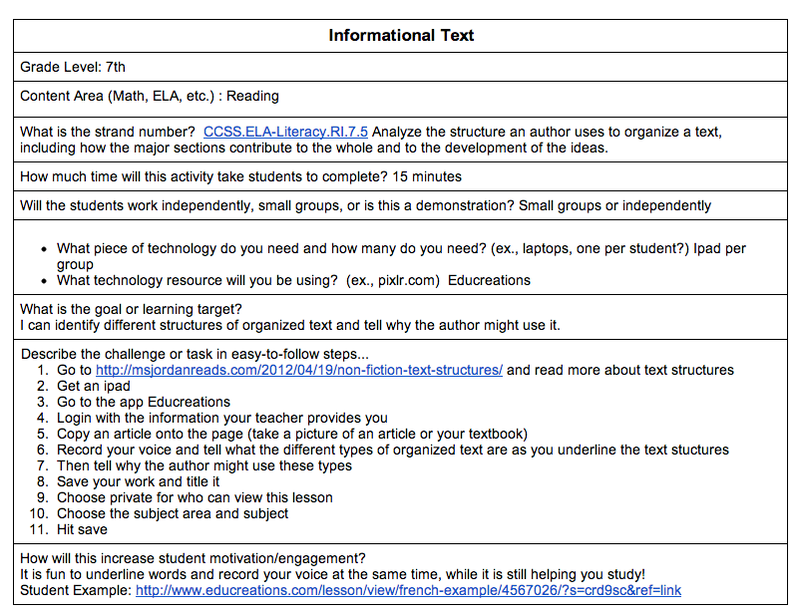 How can we make the content easier for students to understand? How can we make the learning more engaging? After developing a strategy for teaching or reinforcing the concept, students either start independent research to find an appropriate technology or they conference with me and we determine a technology that fits their needs. Just like adults, the students sometimes got so eager to jump into using a technology that they already knew (or found interesting), that they were trying to mold their content to fit the technology. As we know, the pairing of the content, pedagogy, and technology should be a best fit if we’re going to hit that sweet spot! I circulate during our entire time together and hold a conference with every group before they embark on using a specific technology. We review how the technology interacts with the whole of TPACK to increase student engagement and understanding. We have displayed the finished Remixes on our class website. Our next step is to actually complete each remix, evaluate them, and provide feedback to the creator. Everyone is super excited to see what others have come up with- we have lots of new technologies being discovered! A Totally Cool Note . . .
We begin each class period with students defining the expectations for the day (using “Tech it Out”), and the students have taken full ownership of this now. Two weeks ago we were delivering lessons on personal web-enabled device expectations and a group of about 40 students were in the session. As they came in, two students I have in one of my technology enrichment rotations came right up to me before sitting down and asked if they could Tech it Out for the group. I asked them if they really wanted to- I hadn’t intended on it and a bulk of the students were unfamiliar with the procedure. They insisted and were so excited to share. They got the attention of the group and set the expectations for our time together. Pretty cool to see from two seventh graders! I was like a proud momma and even more excited that this idea was something they consciously noted when coming into the space. They truly set the “tech”spectations high! Categories: Teen TPACK | Permalink. As the weeks have passed, we have completed the rotation of the three tech enrichment groups in school. So…here’s how it went! Engagement: Every lesson revolved around student engagement. We had serious dialogue around what engagement means to the students and what truly engages them. I was surprised by how straight forward the students were. Right away, they called out subjects that they felt didn’t inspire them due to the way they were constructed. Less talk, more sharing and activity were the main themes they presented. We then went on to students rating their own engagement at the end of each technology lesson. We use a scale of 1-3 to rate engagement (1= totally off task and disengaged, 2= completing task but getting sidetracked, 3= totally “in the zone”). Out of the 12 lessons that I taught to the three groups, I only had one lesson that was an epic disaster…maybe I’m exaggerating, but as teachers, we all know the feeling! Seeing as I had taught the same exact lesson to two other groups (and, honestly, this was the best version because I refined it as I went), something was just off this day. As I talked to the students after the lesson, the reflection was that they wanted more creation on their part during the lesson. Noted! TPACK: Relevance. This was the main idea that the students pulled out of the discussion of TPACK. They started to note their own classroom experiences that didn’t align to this: watching videos that didn’t align to the content and using resources that didn’t make sense were discussion points. They discussed their frustrations when this happens and how it “impacts learning”. I was very impressed at how seriously they took the challenge to think about their educational experiences and how it could be improved. Creating: During our rotations, I modeled “Everyday Remixes” for the students during the first two lessons. Everyday Remixes take everyday classroom activities and remix them to increase student engagement through the use of technology. Our first remix was introductions. Students used http://pixlr.com/ to create a photo mash-up that represented them. The second remix was using http://blabberize.com/ . Students had to create a “talking head” that was told in first person from the point of view of a historical figure. After these two challenges, students used a template to create their own Everyday Remixes. We looked at it as a way to “spice up” their classroom experience. For the next two class periods, students used this Google Doc to write their directions and ideas. They then shared it with me and I inserted comments for revision, positive feedback, and ideas for pushing them a bit further. They revised their Doc and then shared it so that it could be posted to our website. And of course, the class that was most disengaged in the section above created some of the most dynamic remixes. Teen Talk: So, what did the students think? The biggest discussions we were having were around what makes technology “fun”? 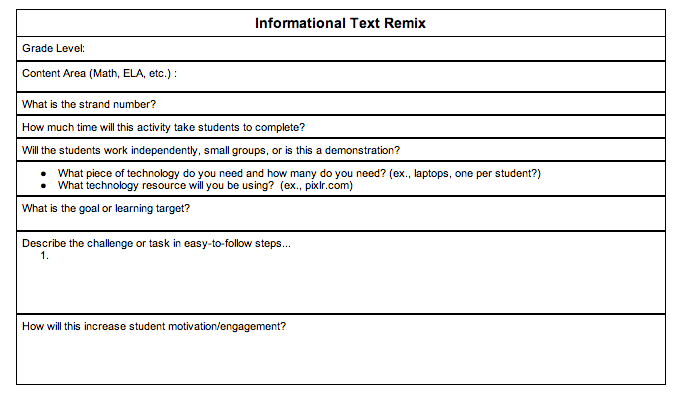 When students were reflecting on their remixes, they weren’t allowed to simply say, “using this resource is fun”. They had to give an explanation of why this was fun and why fun is motivating to students. The number one answer to this was creating. The students commented on how they got to create their own work and develop their own ideas. The more creating we did, the more the engagement ratings went up at the end of class. Now, we’re ready for phase 2! Students will be completing more remix examples that I provide and will then take their lowest NWEA strands and create Content Remixes that other students can use to improve their understanding of the concept. I can’t wait to see what emerges from this challenge and how the teens put their twist on this! Categories: Teen TPACK | Tags: edtech, teentpack | Permalink. What helps us truly understand student engagement and motivation? Hitting the streets and catching the beats…opening our ears without fears…listening to the ones who are getting it done. Whatever the clever phrasing may be, it’s all about having open and honest dialogue with our students. After all, especially at the middle school, they sure have an opinion and love to be heard! As I was dialoging with a colleague about TPACK (http://tpack.org/) and the critical evaluation and thought that should go into technology integration, I was left as I usually am after discussing TPACK, like a Glowworm. That’s right, you remember the toy! My cheeks were that rosy red and aglow. My hands were resting with precision on my temples, trying to pull some genius statement out that could possibly encompass my enthusiasm for the fabulousness of TPACK. As usual, I just couldn’t find the words. However, I did find an idea in that moment. An idea that made my Ed Techie heart beat an insane rhythm and compelled me to email Punya Mishra and of course call my mom (of course I waited until the school bell rang, but it was a close call). I thought, let’s put TPACK in the hands of the teens! Why not?! One of the teams at school had just asked me to teach a technology enrichment class. I would have a group of 7th graders that met every other day. We would meet for four sessions, then I would receive another group of 7th graders. I would go through this rotation three times and then have my first group back. This was the perfect opportunity to roll out my teen TPACK idea. Curiosity consumed me…how would they handle it and what would they do with it? This blog will serve as a reflection portal for our journey!